Essie Good To Go Fastest Drying Top Coat .50 oz. 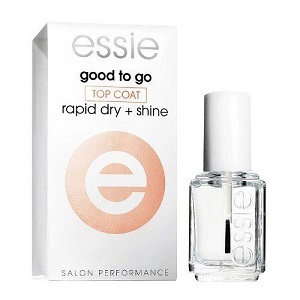 Essie Good To Go Fastest Drying Top Coat, .50 oz. size. Patented formula dries nails in 60 seconds! Quickly penetrates nail color almost instantly. High gloss, non- yellowing formula protects nails to make nail color last longer on nails.